Vita.mn is back at with yet another contest rewarding the outer beauty of our lovely locals, and who are we to argue? You guys are pretty hot! 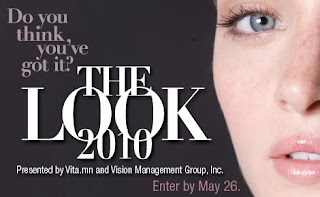 Not to be confused with Vita.mn's annual "Hotness" contest, this particular competition is geared towards aspiring models, whereas Hotness was geared more towards the average (hot) Joe. The rag has partnered with Vision Management Group, a Minneapolis modeling agency that books models internationally as well as locally. The winner will score an all-inclusive, 1-year modeling contract and portfolio with Vision Management Group, a runway slot in Vita.mn’s Poolside Fashion Show June 10, a cover and spread in Vita.mn’s fall fashion guide, and a trip to NYC for a sit-down meeting and look-see with a premium modeling agency. And just like the Hotness contest, anyone can enter, and submissions are being accepted now through May 26th! As of May 28th, 16 finalists will be selected by a panel of judges and a public online voting process will commence. Said finalists will then compete in a "walk off" on June 3rd with one lucky lovely being crowned.